Porter’s five forces model helps in accessing where the power lies in a business situation. Porter’s Model is actually a business strategy tool that helps in analyzing the attractiveness in an industry structure. It let you access current strength of your competitive position and the strength of the position that you are planning to attain. Porters Model is considered an important part of planning tool set. When you’re clear about where the power lies, you can take advantage of your strengths and can improve the weaknesses and can compete efficiently and effectively. Substitute product is by a company earning high profits so can reduce prices to the lowest level. In the above mentioned situations, Customer can easily switch to substitute products. So substitutes are a threat to your company. When there are actual and potential substitute products available then segment is unattractive. Profits and prices are effected by substitutes so, there is need to closely monitor price trends. In substitute industries, if competition rises or technology modernizes then prices and profits decline. There is variation in attractiveness of segment depending upon entry and exit barriers. That segment is more attractive which has high entry barriers and low exit barriers. Some new firms enter into industry and low performing companies leave the market easily. When both entry and exit barriers are high then profit margin is also high but companies face more risk because poor performance companies stay in and fight it out. When these barriers are low then firms easily enter and exit the industry, profit is low. The worst condition is when entry barriers are low and exit barriers are high then in good times firms enter and it become very difficult to exit in bad times. There are number of small or equal competitors and less when there’s a clear market leader. These situations make the reasons for advertising wars, price wars, modifications, ultimately costs increase and it is difficult to compete. When suppliers have more control over supplies and its prices that segment is less attractive. It is best way to make win-win relation with suppliers. It’s good idea to have multi-sources of supply. Buyer’s bargaining power may be lowered down by offering differentiated product. If you’re serving a few but huge quantity ordering buyers, then they have the power to dictate you. 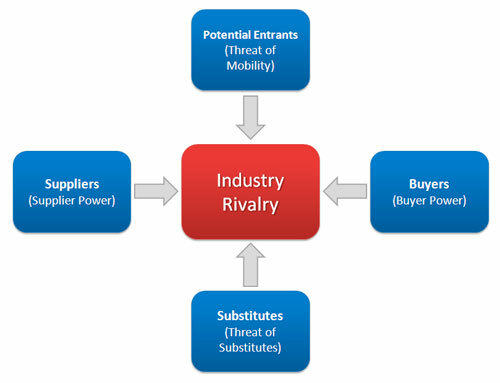 Michael Porters five forces model provides useful input for SWOT Analysis and is considered as a strong tool for industry competitive analysis. Simplified explanations.I can now destroy UNILAG’s Prof.Ejiogu’s questions that relate to Porter’s Five Forces Model. Simplified explanation.I can now go with confidence to answer questions relating to Porter’s Five Forces Model.